Paris-based artist François Perrodin, born in 1956, is presenting new works at Galerie m Bochum from April 28th to July 30th. 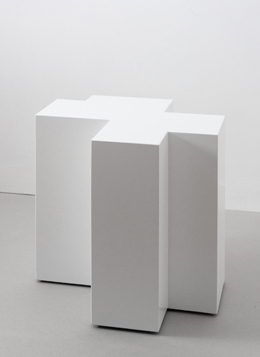 While his last show at the gallery, in 2014, featured monochrome wall objects, the artist’s current exhibition, Standing Solids, consists of sculptures conceived as stand-alone works which, when placed together, form a site-specific room installation. The monochromatic white sculptures displayed in the First Gallery are subject to the same strict formal rules as the rest of Perrodin’s oeuvre – a concept based on precise calculations that determine the proportional relationship of the forms of his sculptures. The point of departure is always a basic geometric shape which the artist then modifies according to this system to develop a number of variations. 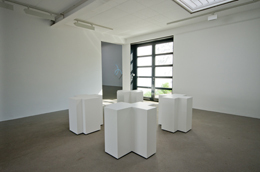 The sculptures on view in Bochum are accordingly based on a common principle: Perrodin varies the form of the four cubes in accordance with four defined cuts, which can be combined in alternate ways. The individual bodies thus relate directly to one another, because all corners are mirrored by the sculpture placed opposite. As a result, a square-shaped space is defined between the four works. What’s more, the works are placed in the center of the gallery, enabling the artist to alter our perception of the room and make us more aware of its own square floor plan. Perrodin delights in exploring our perceptual habits, which reflexively cause us to seek harmony, order and clear categories and thus to try to place the seemingly asymmetric sculptures in a symmetrical order. With the sculptures in the work group Standing Solids, François Perrodin has once again addressed in his typically minimalist formal language the site specificity and the aspects of proportion and asymmetry, seriality and variability.